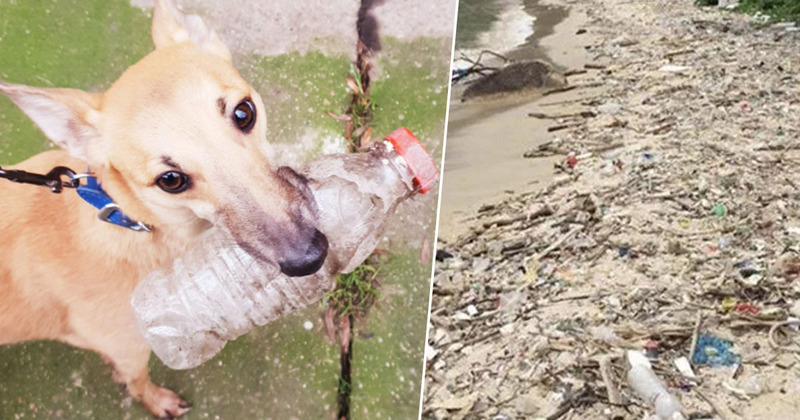 A dog has joined the incredible #Trashtag challenge by handing over plastic bottles in exchange for treats. The new viral craze sees people sharing before and after pictures of an area of land which was filled with trash, and now, thanks to the hard work of some lovely people, is litter-free. Areas can take hours to tidy, but in an effort to make our suffering world that little bit cleaner, people all over the planet are more than happy to get involved, transforming beaches, parks, lay-bys, and a whole host of other locations. The trend makes a nice change from past viral crazes – namely the dark months of the Tide Pod challenge, and all those baffling In My Feelings dance videos. Instead, #Trashtag is useful, motivational and reminds us that there is some good left in the world. It’s unfortunate that mankind is the reason behind all the trash being there in the first place, but at least we’re doing something about it now, albeit at the eleventh hour. It’s not just a few kind humans who are making the effort to make our world a better place, either. One helpful dog named Midge has also caught on to the trend. The obliging dog can be seen carrying cans and plastic bottles in various different locations, and presumably his walker then properly disposes of the trash and rewards Midge for his service to the community with a tasty treat. I suspect the animal is probably more in it for his rewards than anything else, but his owner is certainly on to something by making him seek out leftover rubbish! If everyone got their pets involved, I’m sure the world would become a cleaner place much faster. Though, our dog treat supplies might diminish quite rapidly. Hopefully the trend isn’t one that will die out any time soon; our planet needs help now more than ever. In picking up litter, we can restore at least little sections of our environment back to their natural state, and ensure the planet is less of an eyesore. Whether you do it for the ‘gram or not, take a minute to jump on the #Trashtag trend and pick up some litter if you come across any. Every little helps!